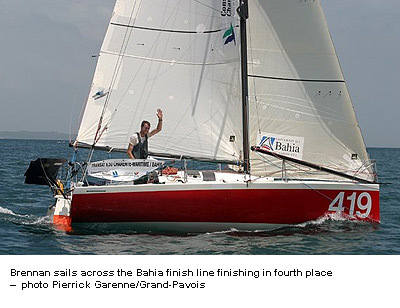 Nicko arrived today in Bahia at 15:27 after completing the 2nd leg in 18 days, 2 hours, 10 minutes and 3 seconds. This left him in 4th place on Leg 2 of the Mini Transat. Coupled with his first leg he finishes overall in 5th place out of the 89 competing boats. After being delayed by bad weather, the first leg of the Mini Transat 2007 finally got underway on September 18th headed from La Rochelle to Madeira. You can check out the race website and also the real time race tracker. The second leg from Madeira to Salvador in Brazil begins on October 6th. The official entry list has now been released. This is the document that finally confirms our position in the Mini Transat 2007. This year required 3,100 miles to make it into the final 75 (up from 72 last Transat). This compares with 1,240 miles that was required to make the cut for the Transat 05. Our 16th place on the year is reward for the miles raced in the Atlantic circuit this season where we raced every race apart from the Chrono (time trial event). We are currely in 32nd place on the waiting list for the Mini Fastnet. All of this year's Atlantic races were oversubscribed on entry day. The popularity of the class was underlined by the Transcascogne which had 156 entries for only 75 places.